Josh's new Google Apps site. Me in front of N9171A, a PA-38 that I took my PP-ASEL checkride in. I got my private pilot in November 2008. David Wihl and me (in the right seat) on short final to runway 29 at KBED in N97RJ (Cirrus SR22). This was my third time trying to fly the Cirrus, and I came in hot and high each time. 310 horses is a lot more than 112. 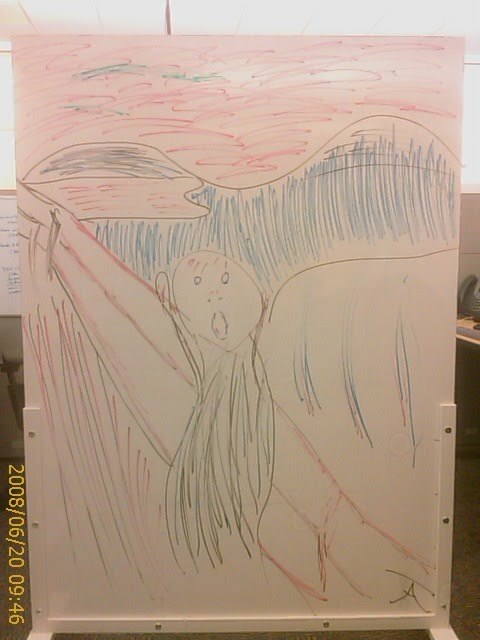 A dry-erase marker drawing I did during an impromptu whiteboard art battle with a coworker. I like to think that I won.